The Billie Holiday Discography contains a version management system. The goal of the version management is to inform you about all changes during the last version. This page shows all new additions and updates of the new version and all previous versions. Musician Jonah Jones added to session November 19, 1936. Webshop offers now downloadable albums in MP3 and Flac formats. Some small fixes and a new CD/DVD box added. The Billie Holiday has been renewed with a better design en improved behaviour. The double-CD Banned From New York City - Live 1948-1957, Vol. 2/2 contains 5 previously unreleased songs from the 1954-Mar-07 conecrt at the Hi-Hat Club in Boston. Also all 9 volumes of the 'Rare tracks from the BHD' are available on 1 DVD disc in Mp3 or Flac lossless format. The Billie Holiday has been renewed with a better design en improved behaviour. The double-CD Banned From New York City - Live 1948-1957, Vol. 2/2 contains 5 previously unreleased songs from the 1954-Mar-07 conecrt at the Hi-Hat Club in Boston. Two tracks on the Masters of Jazz vol.24 were incorrect. The Perfect Complete Collection on vinyl is added. Thanks to Lawrence Collins for providing the information. Some typo's fixed in names of musicians and sessions, thanks to Dexter Edge. All dates are now rendered in US-localized style. Michel Fontanes recently released volume 27 of the Master in Jazz collection with 44 new recordings made during the "Lady in Satin" sessions. Also all 26 previous releases of the "Masters in Jazz" series are edited or added. Thanks to Theo Kuijpers: after seven years, Theo found 2 new recordings of Billie Holiday recorded at Leonard Feather's party. Billie sings two tracks and is accompanied by Helin Merril on the piano. From the website http://http://jazzstation-oblogdearnaldodesouteiros.blogspot.com: "I usually don't refer to YouTube here, except for some notable exceptions. And this is the case. Billie Holiday & Helen Merrill singing "You Go To My Head" together in November 1956 (at Leonard Feather's home at 340 Riverside Drive in New York), with the man himself (jazz's most important historian ever) at the piano. A treasure!" Again, Many thanks to Ruud "Billie Fan" Baas for collecting old LP's and new CD's with material of Billie Holiday. I hope we will continue working together on this unique website. I want to thank Ruud "BillieFan" Baas and Bo Lindqvist for sending information of many old 7-inch EP's. It's great that the discography gets enriched with these classic albums. Also many thanks to Theo Kuipers for all the new pictures (200+) of Billie Holiday. Update 36 includes many new albums. I want to thank Ruud "BillieFan" Baas and his wife Ans for all the hard work you have done last year. It took a long while before I managed to make this new version because of our movement to Arnhem but I hope we will continue our work on this great website. Also many thanks to Bo Lindqvist for the corrections on the Columbia tracks on various albums. This update has new announcements and a lot of updates on the Billie Holiday Discography CD's: the 6-pack is extended to a 9-pack. Tracks from the 'Broadcast Performances Vol. 1 & 2 & 3' are now integrated into the 9-pack. Also all the 219 tracks of the new pack are in chronological order. The new version of the discography contains more than 1000 photo's (thanks to Theo Kuijpers), almost 20 new albums (thanks to Ruud 'Billiefan' Baas), improved images of albumcovers (thanks to Ans) and a couple of added 'Announcements' in various sessions (thanks to Theo and myself). A update with new photo's of Billie. Some of these photo's are coming from video material of her movie and TV appearances. Thanks to Theo Kuijpers for finding all these new pictures. Also the DVD 'The Ultimate Collection' was added. This DVD is special because it contains the complete footage from 'What a little moonlight can do' from 1958 but even better, it contains like no other DVD the complete registration of the 'Stars of Jazz (TV)' form august 13, 1956 in very good quality! We finally crossed the border of 1000 albums!!! Ruud and Ans: Many, many thanks for all this work!!! Theo Kuipers found another 160 photo's of Billie Holiday and these were added to this new version. Thank you very much for all the research you did on these photo's. The site also became a new and fresh layout. I hope you like it. 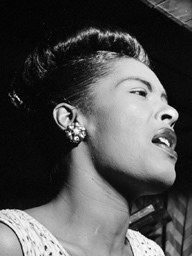 Because of a re-design, the Billie Holiday Discography Site is now allmost entirely W3C-Valid! You can view it now whit many other browsers including Mozilla FireFox. Even better: It is optimized for Firefox! Yesterday I received the 12 CD-Box 'Perfect Complete Collection' from amazon.de. I noticed some differences with the data in the Billie Holiday Discography database and synchronized the database with the information from this CD-Box. 11 new albums were added thanks to Ruud "BillieFan" Baas (Halfweg, The Netherlands), plus 150 new foto's and comments were added tanks to Theo Kuijpers (Den Bosch, The Netherlands). Thank you to my Billie Holiday friends! Also many thanks to Theo Kuijpers from the Netherlands for your research on the Billie Holiday Photo's: Until now, these photo's were the missing part on the site, but not anymore. And last but not least: many thanks to Ruud "BillieFan" Baas for the information of new albums and all the corrections on existing albums and missing albumcovers. I hope the four of us together will reach the magic mark of 1000 albums! Another 41 new albums in version 26. Ruud 'BillieFan' Baas has to dig deeper in his record collection but he still finds new stuff: many thanks for all this work! Furthermore, a update of volume 2 of the 'Rare tracks of the Billie Holiday Discography' thanks to the sharp eye of Dan Brown from London. He discovered a wrong version (october 1946) of the song 'Travlin Light' on this volume: the right version is the one from june 1942. Thank you , Dan. Only 165 albums left to reach the magic marker of 1000 Billie Holiday album's, thanks to the hard work of Ruud 'BillieFan' Baas. Special thanks for using Ruud's info about the musicians that played with Billie Holiday. Thanks to Theo Kuijpers for finding the most interesting new Billie Holiday CD for years: Finaly there is a CD with new material of great quality that was never issued on CD or vinyl before! Also thanks to Corinna Blaumond from Berlin for sending information of new albums using the BHD database. 'Billiefan' Ruud keeps the fire burning and sended over 50 albums: Thank you very much. Also a contribution from Finland: Jarmo Lehtovaara was the first who sended me albuminformation in XML-format generated by the BHD userdatabase. Thanks for using the database. In the next version a new session will be added: Theo Kuijpers has found some new information! A new version 18 of the series "Masters of Jazz" included (Thanks Michel Fontanes), and a lot of new albums from Ruud "BillieFan" Baas from the Netherlands: Thanks again for all this work! Another quantumleap reached: over 700 albums of Billie Holiday on the Billie Holiday Discography Site. Many many thanks to Ruud "BillieFan" Baas for sending all this information and for the motivation to carry on. Heading for 800! The first version with information about Billie Holiday on film/video/DVD. Many thanks to "Billie Fan" Ruud for the information of 30+ new LP's. The Real Lady Sings The Blues. Many thanks to Ruud for the information of lots of new CD's and LP's and to Theo for his investigations to the new interviews first issued in the documantary 'Billie on Billie'. Also thanks to Per-Olov Alfredsson for his corrections. SPECIAL THANKS to Jean-Jacques Becciolini from Switserland for offering the 2 possible NEW Billie Holiday songs. Many thanks to Ruud for the information of 37 new CD's and LP's. Many thanks to Ruud for the information of 60 new CD's and LP's: I believe there is no greater Billie Holiday CD collector in the world. Also I would like to thank Theo Kuijpers for all his information, LP material (beautifull souding LP's that I still have to digitalize…) and Video's and DVD's that I borrowed last year: without his help the Billie Holiday Discography Site wouldn't have 500+ albums at her first anniversary. Many thanks to Ruud for the information of 18 new CD's. Thanks to Theo Kuijpers, 11 new sessions were added. These sessions are mentioned in Jack Millar's "Fine and Mellow" and all contain unissued tracks. Also thanks to Theo for all the scanned LP-covers. Thanks to Ruud for the information of 3 new CD's. 3 volumes of the "Legendary Unissued & Rare Masters" are added (Thanks to "Billiefan" Ruud). The "New Orleans" sessions are updated: Now there are 6 sessions related to "New Orleans". The sessions are logically split based on 'personel' and 'date'. The 1st session is with only voice and piano (Charly Beal), the 2nd with Louis Armstrong and his Band, the 3th with Louis Armstrong and his Band and a Choir, and the 4th with Louis Armstrong and his Orchestra. The 5th and 6th sessions were recorded a few weeks later: the 5th session is with Louis Armstrong and his Band, and the 6th with Louis Armstrong and his Orchestra. The tracks from the "New Orleans" DVD were added to these sessions based on the instrumental setup of the sessions. The playing times of all Billie Holiday songs were updated based on the original playing times of her CD's. 2 new tracks are added: On both tracks Billie doesn't sing, but these are tracks from the same session so that’s why I mention these tracks. Six new tracks are added: 4 tracks from the DVD of the movie "New Orleans" and the complete sequence of "A symphony in black" were added to the discography. Also the Carnegie concerts from 1946 were updated ("Fine and Mellow" stated wrong tracks and sessiondates). Six of the new albums on the BHD are albums which contain all the rare tracks that are not on the standard Billie Holiday albums (i.e. Complete on Columbia/Decca/Commodore/Verve/Storyville, Broadcast Perf. Vol 1/2/3, Stratford, Live In Europe an Lady in Satin). These albums are very usefull if you want to collect all the music of Billie Holiday: These 6 CD's together with the standard albums will make your collection complete! you can buy these CD's at the Billie Holiday Site only. The japanese 12 CD-box with live performances is added. Thanks to Len for the information on this box. Also added a second box with the decca recordings. Thanks to Theo Kuijpers, the discography is now largely extended with more than 50 albums on vinyl. Further a new session (Kopenhagen, Danmark, 18-jan-1954) with 10 unissued tracks is added. Sings Songs From The Motion Picture "Lady Sings The Blues"
Now, the discography contains the complete italian JUTB CD-Box with 12 CD's of Billie's Live performances. Some of the tracks on this box are realy hard to find. There is also a japanese box added with the commodore sessions, and Volume 17 of de series 'Masters of Jazz' with the newly found 'That Ole Devil'. Also added is a LP named 'On the Air' (Totum1037) with the complete radiobroadcasts of 25-6-1944 and 13-1-1947. Due to this addition, the session 25-6-1944 has been updated with 3 new tracks, and the session of 13-1-47 with 2 new tracks: All 5 are 'Radio Broadcasts', so no new songs of Billie. Many Thanks to Theo Kuijpers for the albums and all the information.